In 1963, Ball was employed by the State Mutual Life Assurance Company of Worcester, Massachusetts as a freelance artist. He was tasked with creating a symbol that would boost the employees' morale. It took Ball less than ten minutes to create it, and so the smiley face was born. Over the years, Ball became concerned about the increasing commercialization of the smiley face. 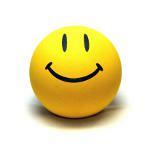 To remind people of its original meaning and intent, he created World Smile Day. The holiday's motto is “Do an act of kindness. Help one person smile”. On this day, people are encouraged to smile at each other, bringing good cheer to the world. Ball passed away in 2001. To honor his memory, the Harvey World Smile Foundation was established. The Foundation continues to organize World Smile Day as its official sponsor. Every year, numerous World Smile Day events are held thorough the world. They may include, but are not limited to, performances, concerts, flash mobs, charitable events, etc. Every year, the Foundation presents a Harvey Ball Smile Award to a deserving community leader on the occasion of the holiday.